It's pretty uneventful, boring compared to most, but I thought I'd share, anyway, just in case any of you forgot what an aggressive "landing" looked like. I'm going to need to get back there as often as possible before Memorial Day when all that beautifully empty horizon gets replaced with hordes of sunbathers. Yeah it was really cool there. I've been to beaches that were long, but this place had A LOT of width to it! It was like a 1/4 mile from where the sand first started to the water. I think it's possible that even in dead of summer there might space enough to fly towards the back, being as most folks will want to be closer to the water. @Adamld13: Agreed. The colors really pop. It reminds me of dragon's wing a little, too. You just need to get to the beach around 7am-8am to get in a few good hours of flying before the beach crowds. And yeah, that does look like a rally nice beach... nothing to hurt the sail there. Actually, it was my 12th! So lemme ask, heavy kite, wrong lines, bad wind, bad location, or just a bad pilot? Maybe all of the above? I don't suppose anyone can tell what the wind speed was just by looking at these videos? I realize Prism's "4-25" may be a bit lofty, but I would think 6-8ish would keep the kite aloft, no? What was I flying in the video from the first post in this thread? 12-15mph? from the flag in the frist lil video I would call the wind at a pulsing 2-4 and if I may ask was there trees behind you from the direction the wind was coming from ? First you had bad shifty winds up to 40 degrees. Judging by the flag they were in the 2-4 range with gusts up to 6. 2nd you are inexperienced and probably had the kite set up wrong for the wind as well as the fact that you were flying at the edge of the window. From what I could tell you had the kite set factory which is fine for 10-12 mph. For the hypno set it at the light wind knot and leave it there as well as put it on the forgiving turbo setting. It will fly a LOT better in low wind even with the stock lines. Third is your arm position. YOu are doing the cross pose, arm fully out to your side and that will kill you in low wind. Keep your elbows at your side so you can get good arm motion for pumping the kite. YOu had enough wind to fly but not enough to do it without a little work. Look at the light winds section of the dvd that came with your kite and you will see the arm motion I'm talking about. YOu can also watch me here and see how I keep my arms while doing these slides in really low wind. Always elbow at my side hands in front. Best position to use for when you have to pump the kite to get it back up and easiest to give lots of slack from. http://vimeo.com/19018195 IF you watch the last couple minutes of my vid you can see how I pump the lines to get the kite back up. Last thing is when you need to pump the kite up in low wind don't pull hard or jerk the lines. pull smooth and releas just as smooth. THe lines should not go slack when pumping the kite to get extra drive. Yeah, there were lots of trees in every direction, and houses after that. Definitely not the optimal location, but I was running out of options. So it seems like an "all of the above" situation. That makes me feel a little better, I guess. Thanks for all the great advice, Anthony. I re-watched both the low wind section on the Prism DVD as well as your video. Those helped a lot. I was definitely flailing there. I just felt so helpless with all that slack line in front of me. It's good to know with a combination of factors I'll have a much better time flying in lower winds as is, but I'd still love to get a hold of some shorter/lighter lines just for sake of comparison. Question about the bridal settings, if you don't mind? I'm clear on the turbo settings, but where exactly is the light wind setting for the bridal. I have to assume this adjustment is going towards the nose of the kite, yes? 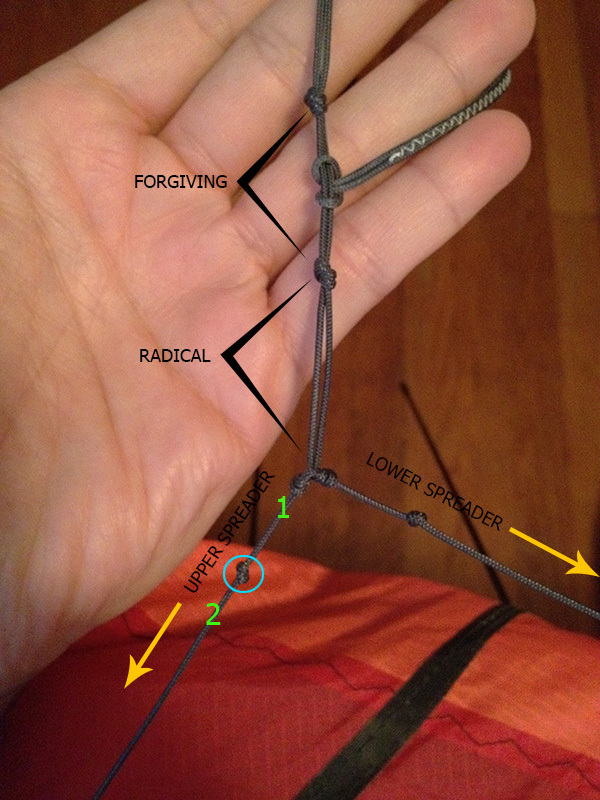 Everything I've read thus far suggests small 1/4" increments to find the right spot, so should I be sliding the prussic knot to "1" or should I be moving it completely over and past the blue knot to around the "2" area? Isn't the radical setting further away from the tow point?or you are mistaking in the picture. as in your picture, moving the inhaul (line attached to the center T) closer to the tow point (prussik knot) will make it a 3 point bridle. As from the picture, i will keep it here and recall i fly with this settings. Moving it further from the tow point will make the turbo leg longer and small and precise inputs are required for this flying style. Anyway this is not for wind settings. So what you need to do here is move the knot (prussik knot) towards the upper spreader. Thus you are putting the nose of the kite more into the wind and it will gain more lift and fly better in light winds. This is referred sometimes as raising the bridle as if you put your kite in launch position, moving it to the nose is raising it more and pointing the nose more into the wind. The hypnotist flies best in clean 6-8mph winds with the factory bridle set as in the picture. I rarely lower my bridle but you must know that raising a bridle to gain more lift will affect control on the kite. A heavy bridle (factory or lower) will give sharper turns and corners and better responsiveness. 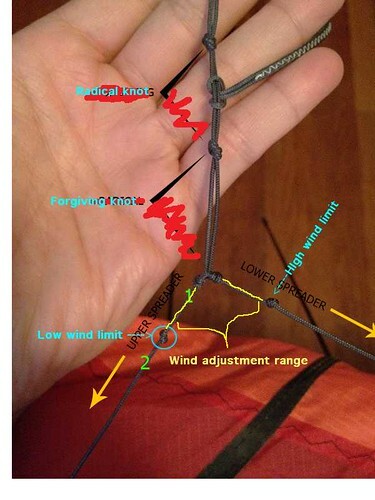 At this stage it's better to move it up a bit in light winds and return it to factory in medium winds but you will learn on the field what are different effects on bridle adjustment. The hypno features limit knots that will refrain you from going further in your settings and this is good for new fliers. Now you should know that only 5-6mm of adjustment is needed for this (1/8" i think) and adjust by little increment to start with. Oops, you're right, I reversed the radical setting in that picture. So, then I should only move the prussic knot a little ways forward then towards the "1"? I should never have to slide it over the knot in the blue circle? I'm on my way to the beach now where it's a perfect 8.1 knots, but I will try these adjustments tomorrow when I return to suburbia. Moving it to the top knot (blue circle here) has given more lift to the kite that will help it fly on lighter winds but still on the hypnotist, the flier have to work on the kite to keep it aloft and you will find that walking backwards is necessary here and pumping on the lines to too. Try adjusting it just a little bit and try..moving it all the way from the factory to the limit will have a big effect on the kite flying characteristics...unless you know what you are doing here. I edited your pic to be correct. YOu have all the wrong ideas about the adjustments which isn't uncommon for a new flier and you probably did like most of us men and ignored the instructions THere is no range for radical or forgiving just the knots. THe only range adjustment is for wind. Set it to the low wind limit and leave it there. Once you get some basic flying down then you can worry about fine tuning for wind. Wait, it came with instructions?! Seriously though, to my credit, I did know that the larks head (inner yoke?) settings weren't for wind adjustments. I just wanted to label ALL the points to be thorough. I'm always doing this. You should hear me ask a question in person. I don't just jump in and ask, I have multiple prefaces first. I think I get it now, though! Thank you both very much for setting me straight. I appreciate all the help. Yeesh! You ever get that feeling it just wasn't meant to be? THats because kites aren't safe or take up too much room or cause damage to the beach or whatever idiotic excuse they can think of. Look up the law suit against Huntington Beach because a kid was walking backwards with a kite and fell into a fire pit. THe city is being sued when the parents kids and the ones that had the fire should be slapped for being stupid and not paying attention to whats around them or properly tending the fire pit. I'd really like to see more details on what happens with this one.